Twenty-eight years is a long time to go between films.When the original TRON was released in theatres in 1982, I was but five years old.I can’t say I remember anything about it at the time, other than that the effects and animation were really cool.Special effects have come a very long way since then but after seeing the sequel, TRON: LEGACY, I can essentially say pretty much the same thing about this one as I did about the first when I was five; the special effects were cool and twenty-eight years from now, that will be all anyone will remember about the new one too, if anything at all. The story has not changed.In 1982, Kevin Flynn (Jeff Bridges) was sucked into the computer world he helped design by the Master Control Program.In 2010, it is his son’s turn to play.Sam Flynn (Garrett Hedlund) pays a visit to his dad’s old arcade after not having seen his father for nearly twenty years.Someone is still paying the electricity bill though as everything still works, including the passage way to Flynn Sr.’s secret computer lab.Once inside the system, Sam, a user, is easy to spot amongst all the programs and it isn’t long before he is brought face to face with good old Dad, who has been trapped in this world all this time.Together they must vanquish Clu, Kevin’s virtual counterpart (a surprisingly impressive effects designed younger, more strapping version of Bridges) before he takes his desperate need for perfection outside of the computer and into the real world. The truth about both TRON films is that nothing other than the special effects and some high-energy game playing sequences matter in either of them.How else can you explain that they basically recycled the story from the first for the second?Both films imply that there is something deeper being said about religion, technology and how mankind can’t seem to get his head around how close these two concepts truly are to each other, but neither film actually leaves the viewer with any true insight.Philosophical constructs are simply a device to fill the space between each mind-blowing game scene and this is done adequately enough to distract from how empty all that space really is.It doesn’t hurt either that the space, albeit empty, is incredibly gorgeous, with all its geometric exactitude and bursts of light and colour to break up all the darkness. And so I say, let the games begin. 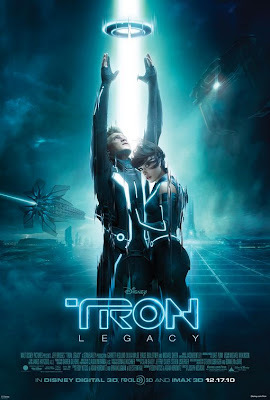 TRON: LEGACY, for all of its clunky dialogue and questionable plot points, is completely mesmerizing when the games are on.The original elements of the games are still intact but updated in such a way that they justify the entire existence of the film.Couple that with the dynamic and driving Daft Punk score and you have two hours that will dazzle your senses like you’ve never known.When those two hours are up though, you will put down the game and it will almost be like you never played at all.